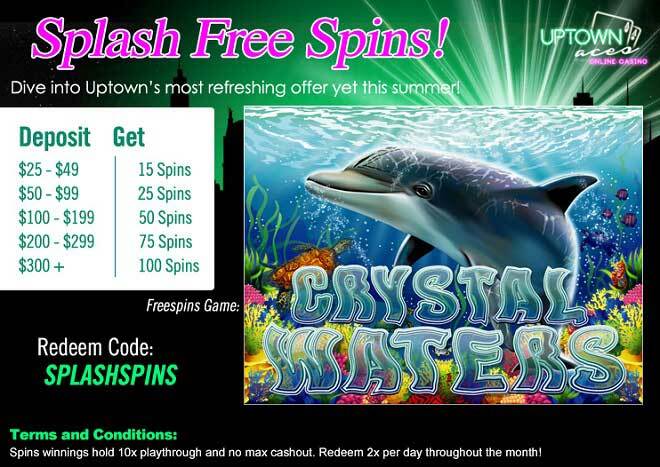 Dive into Uptown’s Refreshing Free Spins! They say you should always wait a few minutes after you eat before swimming, but, thankfully, those rules don't apply this August Uptown! Refresh right from the start when you deposit as little as $25 to play with up to 100 FREE Spins! Your free spins go as high as 100 and you'll be spinning the reels of Crystal Waters - an under the sea themed slot that will have you tasting the cool refreshing vibes of summer alongside Tropical Fish, Cockleshells, Dolphins, Yachts, Sea Turtles and Gold Fish. Plunge into more summertime wins and fun into Uptown's pool of free spins that you can enjoy on your deposits of $25 and up!